Netanyahu said in the Hebrew-only tweet that he was glad Trump “answered another one of my important requests” which will keep the world safe from Iran. It's unclear what the prime minister mean from "another" of his requests, but less than two weeks ago Trump made a dramatic decisions to overturn decades of official US policy and bestow formal recognition of Israeli sovereignty over the Golan Heights after receiving a "quickie" history lesson. It's well known that Netanyahu had personally lobbied for weeks and months for that decision, and on Monday appeared to be touting both as his initiative on the eve of Israel's election. Likely the statement was not made in English in order to avoid making President Trump look weak in front of US political leaders and the American public, while at the same bolstering (in Hebrew to Israel's domestic audience) Netanyahu's ability to immediately make Washington bend to Israel's interests. Though Trump has clearly thrown his full support behind a Netanyahu victory, it doesn't bode well for "America First" having the Israeli leader essentially bragging that Washington policy can be dictated from Jerusalem. Unlike his English tweet simply saying thanks, Netanyahu reveals in Hebrew that Trump agreed to designate Iran’s IRGC as a terrorist organization ”as another important request of mine”. 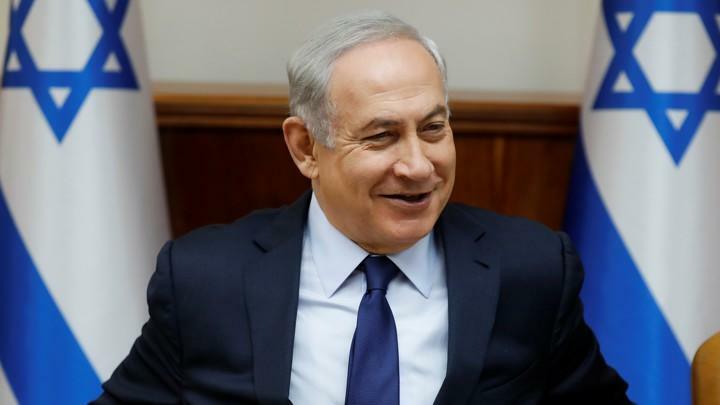 Israelis head to the polls to elect a prime minister on Tuesday, and one key feature of Netanyahu's campaign — lately beset by no less than three corruption charges as prime minister — has been his warm relations with the American president and close cooperation.